Bitter Truth Raila Odinga told Uhuru for what happened in last four years. - Bana Kenya News, Real African Network Tubanane. Home featured Nairobi Bitter Truth Raila Odinga told Uhuru for what happened in last four years. Bitter Truth Raila Odinga told Uhuru for what happened in last four years. 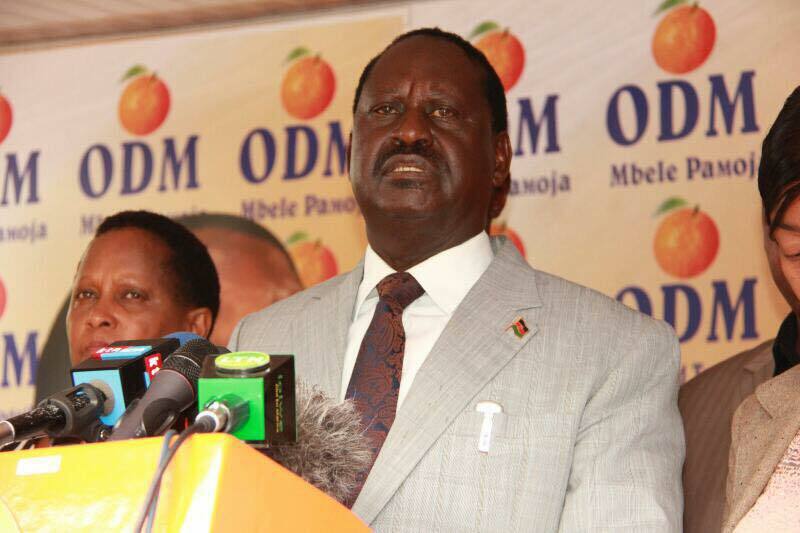 The ODM leader Raila Odinga slammed the progress done by the Jubilee government and termed them as lies. Speaking at the Orange house in Nairobi with his deputy Hassan Joho, Odinga claimed that the Projects that they did were in their blueprint when they were in the government with former president Mwai Kibaki. Odinga rubbished the claims that his tenure as a prime minister did not do anything. The former prime Minister said he has not been a president and what he did is an addition to the head of states he served that time. "When you said prices were low during Moi era, then I was there to make happen. What former president Kibaki terms did, I was with him in any consultations. Thika super highway was done after consultation. The railway line that the current president chest thumb is our project with Kibaki. We had all the details, so I want to tell Uhuru what is his project? The only project that belongs to President Uhuru Kenyatta is the laptop project. Where are the laptops now? How many schools have laptops up to standard four?" Said Odinga. "The laptop project was to start immediately in 2013. Now, we were supposed to have up to standard four because they have been in the office for four years. The president figures do not add up every time." He added. “As of now, we have five wildly different numbers for the people who have been connected with electricity. The President’s figure is 2.9 million, CS Treasury says it is 3.7 million, the Energy CS says it is 5.5 million, and the Deputy Chief of Staff Nzioki Waita says 5.8 million. The figures do not show who were earlier customers and who paid on their own and the ones who were connected by the World bank project as claimed by the Jubilee government.” Added the former prime Minister. “The Jubilee administration says they have tarmacked 10,000KM of a road. When these highways are completed, they will be only 100km shy of Mombasa to Kisumu ( 830 ) plus Namanga to Moyale ( 970 ) plus Nairobi to Mandera (800).Which are the cities the highways are connecting? The existing cities, towns and most municipalities for that matter are already connected,” Raila said. "While in his 2016 State of the Nation address he said Jubilee had built 3,000km of the road, this year, the number came down to 1,950km and in the Budget speech read a few weeks ago, the roads done came down again to 1,500km. Are they un-tarmacking the existing roads? " Odinga Claimed. "The Jubilee Administration has a good progress in stealing taxpayers money. The Eurobond, Dubai loan, Healthy graft, NYS, youth Fund, SGR and making the people life difficult in Kenya. Not only people but companies as well. Some of the Companies which closed down their business in Kenya include; Eveready, Unilever, Softa Bottling Company, Sameer Africa, Cadbury, Summit tyres, Procter and Gamble and Reckitt Benckiser etc, Now they want to close the betting companies and shut down our sports in Kenya." 2.9 million micro small and medium enterprises (MSMEs) shut down in the last five years including 2017, according to a survey by the Kenya National Bureau of Statistics (KNBS). The report, Micro, Small and Medium Establishments, says most of the businesses that shut down were in the wholesale and retail trade as well as repair of motor vehicles and motorcycles sector which accounted for 80 percent of the total closures.